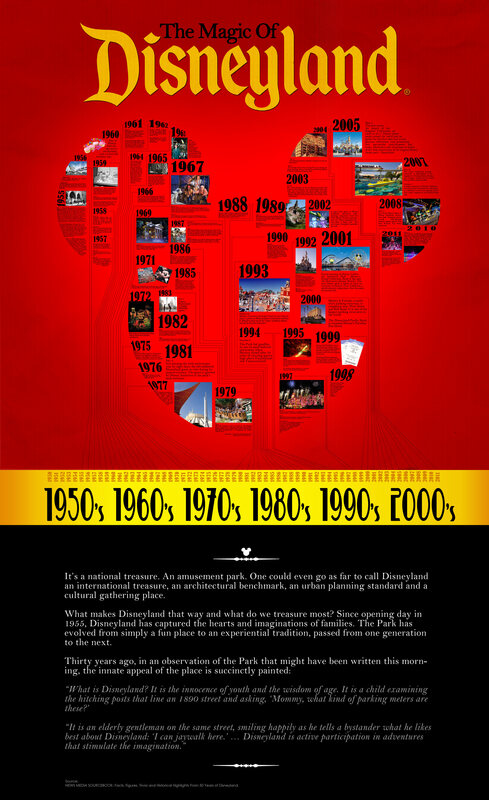 Disneyland Resort first opened its doors on July 17, 1955. Since then it has continued to grow, and millions have come to discover the "happiest place on Earth" and all it has to offer. The graphic below will take you through the events of Disneyland's grand opening all the way up to events as recent as the reopening of Star Tours in 2011. Opening Sunday quickly earns the nickname of "Black Sunday" as the young park is burdened by an overabundance of "uninvited" guests, attractions break down, traffic backs up seven miles on the Santa Ana Freeway, a gas leak occurs in Fantasyland, restaurants run out of food, the freshly poured asphalt on Main Street is so soft that it steals the high-heeled shoes off many a female guest and paint is still drying in many parts of Tomorrowland. The grand opening is televised as a "live" 90-minute broadcast on ABC television. The festivities are hosted by TV personalities Art Linkletter, Bob Cummings and pre-presidential Ronald Reagan and, of course, Walt Disney. Covered by 24 cameras (3 was the norm), the show is TV's most elaborate live broadcast to date viewed by an estimated 90 million viewers. General Admission is $1.00 (75 cents for juniors, 50 cents for children). Cost of individual attraction tickets range from 10 cents to 35 cents. There were 18 ticketed adventures and 5 free attractions/exhibits in 4 themed "lands" and on Main Street U.S.A.
Main Street Omnibus #1 begins servicing Main Street, U.S.A.
Grand Opening of the Disneyland Hotel. The Disneyland Monorail track is later expanded to transport guests to and from the hotel. The spectacular Fantasy in the Sky fireworks display is introduced, a summertime tradition for nearly 45 years. The Park welcomes its 10 millionth guest, a 5-year-old girl. The first annual New Year's Eve Party has 7,500 guests. Today the annual celebration is one of the most popular events at Disneyland. Columbia Sailing Ship (an authentic replica of the first American vessel to sail around the world) premieres on the Rivers of America in Frontierland. The Grand Canyon Diorama opens along the lines of the Disneyland Railroad (it is the longest diorama in the world, circa 1958). Submarine Voyage officially dedicated by Walt Disney and US Navy officials. Matterhorn Bobsleds opens in Fantasyland and is officiated by Walt Disney and the Los Angeles-based Swiss Consul General. Disneyland celebrates its 5th Birthday with a 5-foot-tall birthday cake. Beginning a high school tradition the first all-night Grad Nite Party attracts 8,500 grads making it the biggest high school graduation party ever held in the U.S.
Tinker Bell begins flights from the peak of the Matterhorn and across the sky high above Sleeping Beauty Castle, setting off the summertime firework spectacular "Fantasy in the Sky." Mickey Mouse begins serving as a drum major for the Disneyland Band in its parades down Main Street, U.S.A.
On September 23, The Golden Horseshoe Revue celebrates its 10,000th performance. June 23 The landmark Disney theme park attraction Walt Disney's Enchanted Tiki Room opens in Adventureland. Walt Disney hosts all of the Olympic teams, more than 400 athletes, on their way to the Summer Olympics in Japan with a day at the Park. Comedian Bob Hope and Walt lead a cast of Hollywood starts who entertain the Olympians in a show on the banks of the Rivers of America in Frontierland. July 18 – Great Moments with Mr. Lincoln opens. The Audio-Animatronics figure of Abraham Lincoln is so life-like that some guests ask to go backstage to get the "actor's" autograph. July 24 – New Orleans Square, Disneyland's first new land since Opening Day, opens in a colorful mid-summer dedication. It is one of Walt Disney's last official ceremonial acts before his untimely death in December. Pirates of the Caribbean, the first Disneyland mega-scale indoor ride-through adventure, opens in New Orleans Square. Today the attraction is considered by many to be the quintessential Disney theme park attraction. Walt Disney World Resort in Florida opens. Disneyland welcomes Miss Valerie Suldo, its 100 millionth guest. Mission to Mars opens in Tomorrowland and is an updated version of Flight to the Moon, since man had already reached the moon in real life. At the opening ceremonies of Space Mountain, Disneyland honors America's first men in space as special guests. The attraction cost $20 million and is 188 feet tall and 200-feet wide. The Park welcomes its first-ever birth at "The Happiest Place on Earth" on a busy day near Main Street U.S.A. Mickey Mouse later presents little Teresa with "Disneyland Birth Certificate No. 1" recognizing the unprecedented event. Big Thunder Mountain Railroad opens in Frontierland. Just missing the 25th anniversary year by eight days, the 200 millionth Disneyland guest to visit during its quarter-century. The guest is greeted by Disney characters at the park's main entrance. Former President Jimmy Carter became the first U.S. President to take a "running tour" of the Park when he jogged through the Magic Kingdom prior to the public opening time. The Disneyland ticket book, with its famous A, B, C, D and E ticket coupons, is officially retired. Tokyo Disneyland in Japan officially opens. Disneyland welcomes the 250 millionth guest. He and his parents are presented with a new Cadillac, a trip to Tokyo Disneyland, Lifetime Passports to Disneyland and Walt Disney Resort and many other gifts. Captain EO, a 3-D film sensation opened in the Magic Eye Theater starring Michael Jackson as a singing, dancing intergalactic hero with many new in-theater special effects – produced by George Lucas and directed by Francis Ford Coppola. Star Tours premieres in Tomorrowland, the first attraction collaboration between Disney and Lucasfilm, Ltd. The Disney Gallery opens above Pirates of the Caribbean in New Orleans Square. Originally meant to serve as a private apartment for Walt Disney and his family, The Disney Gallery displays original designs, sketches and models illustrating the evolution of the Park. Disney Dollars are unveiled. Mickey Mouse appeared on the $1 bill and Goofy on the $5 bill. A $10 bill featuring Minnie Mouse is added on Nov. 20, 1989. Critter Country is named and is Disneyland Park's newest "land." Splash Mountain, the most elaborate flume attraction in the world, opens to guests. The new attraction features a five-story drop at a 45-degree angle. Disneyland Park welcomes its 300 millionth guest, Claudine Masson of Chateauroux, France. Disney Chairman and CEO Michael Eisner and Disney President Frank Wells and Roy E. Disney, Disney Vice Chairman were joined by Disneyland Opening Day Alumni former President Ronald Reagan and TV personalities Art Linkletter and Bob Cummings in a rededication ceremony. Fantasmic! opens to rave reviews in Frontierland. The entertainment spectacular through Mickey Mouse's vivid imagination comes to life with pyrotechnics, live performances, enormous set pieces, fountains and projected mist screens. Disneyland Paris in France officially opens. Mickey's Toontown, the largest "land" in more than 20 years, is given an official premiere with Eisner and Roy E. Disney as they unveil the "home" of Mickey Mouse and all the favorite characters. 8,000 runners from around the globe turn out for the first-ever Disneyland Marathon and 5k. The races award $50,000 in cash to the top finishers and to 10 Orange County charities. The Indiana Jones Adventure is unveiled during a star-studded opening gala. Pirates of the Caribbean, in celebration of its 30th anniversary, is reopened after an extensive refurbishment. Disneyland Park welcomes its 400 millionth guest, Minnie Pepito of Concord, California. it's a small world Holiday premieres as an all-new winter holiday-theme overlay to the classic Disneyland attraction, it's a small world. It remains a staple of the Disneyland Resort holiday lineup. Tomorrowland completes a two-year re-building program that includes such new adventures as Innoventions and Astro Orbitor. Disney FASTPASS Service is introduced, providing a time-saving virtual queuing program that uses computers to issue advance reservations for popular attractions. Disneyland Hotel undergoes major changes to make way for a new Monorail station and the new Downtown Disney District. Mickey & Friends, a multi-story parking structure, is completed near West Street and Ball Road. It is one of the largest parking structures in the world. The Disneyland Pacific Hotel is renamed Disney's Paradise Pier Hotel. Grand opening of Disney California Adventure Park, Disney's Grand Californian Hotel & Spa and the Downtown Disney District. The new theme park is home to such attractions as Soarin' Over California, a multi-sensory experience that becomes an instant hit. A Bug's Land opens in Disney California Adventure park, drawing inspiration from the Walt Disney Pictures presentation of a Pixar Animation Studios film "A Bug's Life." The new land is designed especially for kids. The world premiere of the hit Disney live-action film Pirates of the Caribbean: Curse of the Black Pearl takes place. The event features the world's longest red carpet and features appearance by the films stars Johnny Depp, Orlando Bloom and Keira Knightley and producer Jerry Bruckheimer. The Twilight Zone Tower of Terror™, a hair-raising new thrill attraction, opens in the Hollywood Pictures Backlot of Disney California Adventure park. This date marks the launch of the Happiest Celebration on earth as all 11 Disney theme parks around the world join together for the first time ever in one glorious celebration, each premiering new spectacular entertainment and iconic adventures and attractions in honor of the 50th anniversary of the original Disney theme park – Disneyland. The classic Submarine Voyage attraction at Disneyland is reimagined as Finding Nemo Submarine Voyage, inspired by the classic Disney-Pixar animated film. A major expansion of Disney California Adventure park is announced, with plans to culminate in the 2012 opening of the Cars Land, inspired by the Disney-Pixar film. Toy Story Mania! opens at Disney California Adventure park, bringing guests virtual ride-through midway games paired with their favorite Toy Story characters. World of Color, a technically cutting edge nighttime water spectacular, premieres at Disney California Adventure park. The show combines nearly 1,200 colorful fountains with over 100,000 digital images of Disney and Disney-Pixar animation projected on a water screen the size of a football field. In less than a year, over 3 million guests enjoy the show. The Little Mermaid ~ Ariel's Undersea Adventure, Disney's first-ever Little Mermaid attraction inspired by the classic Disney film , premieres at Disney California Adventure park. Disneyland Park's classic Star Tours attraction reopens as Star Tours – The Adventures Continue, featuring 54 various odysseys into the Star Wars galaxy, each in 3-D.